I am super excited because this month of August we are going to be spending a lot of time talking about how to find your dream career, job searching, and figuring out what your passion is. Every Tuesday, I’m going to be on Facebook live to answer one of your questions. I’m switching careers and doing my best to network via LinkedIn. What are some tangible ways I can get the most out of these relationships? How do I e-approach them, and what questions should I ask? I used to not get that many messages on LinkedIn, but these days I’m getting a lot of spam. It’s making me a) really annoyed, and b) really careful with who I’m responding to and how much time I spend interacting with people on LinkedIn. In the messages I’m getting, you can almost always tell they’re copy-pasted, self-promos, or automated emails, and it just turns me away. I’m also getting messages from people who are sending something to me every single day, like a link to a “helpful article that I think you would like” every single day. I actually just end up unconnecting/unfriending them because it is so annoying. So, all that to say, LinkedIn is changing, and it’s more important than ever to stand out if you want to make the most out of your LinkedIn relationships. For example, Erin is using LinkedIn to make her career transition, so it’s really important she stands out to important connections. I want to tell you 3 different steps you can take today to really make the most out of your LinkedIn relationships. First, I want you to find people on LinkedIn who are in roles that you really want to have someday; people you really want to meet. I would also search your connections connections to look for mutual connections they could introduce you to. For example, someone was looking for a mentor and messaged me about it on LinkedIn. I told her to feel free to look through my connections and I’d be happy to introduce her to someone, but I put that work onto her to actually look through my connections (because there are a lot!). If someone looked through my connections and said, “Hey, Anna, I would really like to connect to so-and-so” I would quickly connect them. Don’t be afraid to ask your connections for introductions! They will almost always be more than happy to help you. I would also look through groups: people you want to talk to or meet, people in positions you want, people who would be beneficial to add to your network, and who other people you already know (mutual connections) could introduce you to. Next, ask for an informational interview. Send them a note with some brief information on who you are and how you learned about them. Give them some reason that you’re similar, (ex. you’re in the same group, someone referred you to them, you have a mutual connection or interest) so they know how you found them. I am currently an MBA student at the Rady School of Management at University of California, San Diego. My career counselor at the Rady School suggested I contact you to conduct an informational interview. My passion and desire is to become (your career target) and your background and experience will be invaluable to me as I pursue my career. At your convenience, I would like to schedule a 15-minute informational meeting with you in person or over the phone. The purpose of the meeting is to gather additional information that will better assist me with my career decisions. Thank you for considering my request. Feel free to use this exact template! It works every time. I’ve used it over and over again. In 2011, I did a networking challenge and I conducted 50 + informational interviews in that year using this exact same template. Notice that I’m only taking 15 minutes of their time. People are busy, right? Time is valuable and a lot can happen in 15 to 30 minutes. We just want to ask for a quick 15 minutes of their time. Focus on getting that person on the phone or meeting them in person. Online networking is great, LinkedIn is great, but the value that you’re getting is making that online connection in real life. So talk to them over the phone or meet them for coffee. People really do want help you, but you have to ask! 1. Look through your connections. Find people in careers you want or people you really want to meet. Look through groups or join some groups! You can join at least 50 groups, so I highly recommend joining groups in your industry or in your location. You can also look through your current connections connections to look for people they could introduce you to. 2. Ask for an informational interview. Use this template I gave you! It really does work. Tell them why you’re contacting them and what you want to be. In order to do these informational interviews, people want to know that they’re actually going to help you. They want to know that you’re clear and focused on where you’re going and that their input will actually be of value to you. 3. Ask for 15 minutes of their time and get them on the phone or meet them in person. If they don’t respond, or if they are too busy, it’s fine! They’re probably not the kind of people you want in your network anyway, so don’t get bummed. I think you’ll find that you’ll actually get a lot more responses than you expect! So if you want more LinkedIn tips or advice, we have a whole e-book that I put together for you! 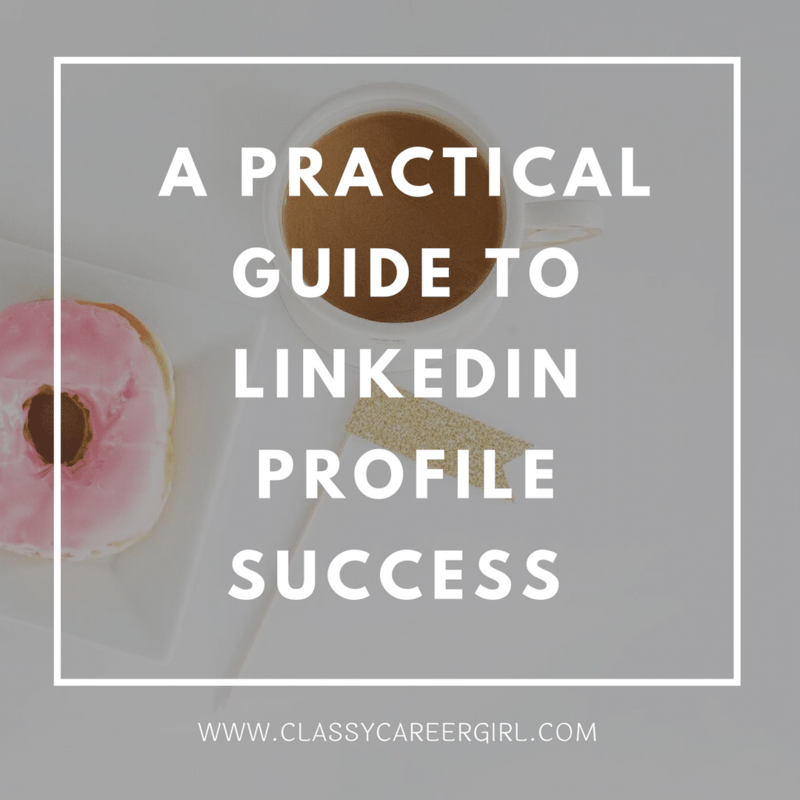 You can download that here: The Practical Guide to LinkedIn: How to Find Your Next Job on LinkedIn! Ivey Merrill is a senior at Point Loma Nazarene University in Southern California and the editor of the guest blog for CCG. She is an avid tooth enthusiast and collector of porcelain dolls. Ivey likes to write poetry and almost won a raffle for an apple watch once.